OTTAWA (Reuters) - Canadian Prime Minister Justin Trudeau's government, seeking to move past a political crisis threatening its re-election, lavished new spending on middle-class voters in its budget on Tuesday, but the measures may be spread too thin to move the needle before October's vote. Trudeau has been on the defensive since Feb. 7 over allegations that top government officials leaned on his former justice minister to help SNC-Lavalin Group Inc avoid a corruption trial. The issue has dragged the party down in opinion polls, which indicate it is at risk of losing power to the official opposition Conservatives in October's federal election. The Liberals looked to counter that narrative with a budget that sprinkled benefits widely, helping everyone from millennials to retirees. But with no single blockbuster pledge and with opposition antics distracting from the Liberals' message, Nanos Research pollster Nik Nanos said the budget was unlikely to put Trudeau's party back ahead. "At best, they can hope to stop the political bleeding," he said. The Liberals fell to 32.6 percent support in the latest Nanos Research poll, behind the Conservatives at 35.5 percent. 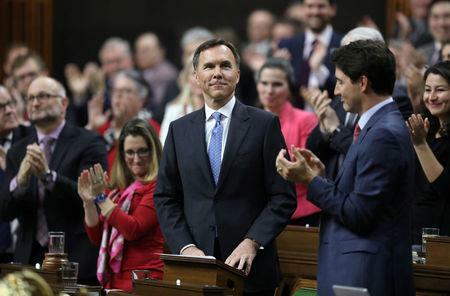 Opposition lawmakers delayed Finance Minister Bill Morneau from presenting the budget for an hour and then the Conservatives drowned out his speech in the House of Commons with shouts and jeers. They later walked out in protest at what party leader Andrew Scheer said was Trudeau's attempt to bury the SNC-Lavalin scandal, calling it a "corruption cover-up." "This budget has no legitimacy and we could not legitimize it by remaining in the chamber," Scheer told reporters. The budget outlined C$21 billion ($15.8 billion) in spending over five years on new measures, including help to get first-time buyers into housing, a new skills training benefit, new perks for retirees and students, and the creation of a federal agency to cut the cost of prescription medications. "The challenge I think with this budget is that there are so many boxes they tried to tick - everybody will get a little bit, but nobody will get enough," said Craig Wright, chief economist at Royal Bank of Canada. "To me, you get more bang for your buck if you have a focused approach," he added. With many Canadians struggling to buy homes amid rising interest rates and stricter mortgage rules, the budget promised measures to help millennials and others boost their purchasing power without taking on too much debt. It introduced a program to let some first-time buyers finance a portion of their home purchases through a shared equity mortgage with the Canadian Mortgage and Housing Corporation (CMHC), a government housing agency. The move, along with other housing incentives, could give Canada's housing market a much-needed shot in the arm, reviving construction and bolstering homeowner sentiment, although economists warned the overall impact may be marginal. "It is a potential concession that they went a step too far in dampening the housing market," said Doug Porter, chief economist at BMO Capital Markets. But there was little in the budget for corporate Canada, despite repeated calls from business groups for wide-ranging tax changes or cuts to boost competitiveness. In his November budget update, Morneau unveiled a plan to allow businesses to write off additional capital investments to help them compete globally, but he stopped short of slashing taxes, saying it would cost tens of billions. The budget also provided about C$3.8 billion over five years in spending on Canada's indigenous people and inched forward a plan to broaden the state-funded healthcare program to help people deal with prescription drug costs. With all the new spending, the projected deficit in 2019-20 inched up to C$19.8 billion ($14.86 billion) from the C$19.6 billion forecast in November. That is sharply higher than the projected C$14.9 billion deficit for the current fiscal year ending March 31, which was revised down from a previous projection of C$18.1 billion.